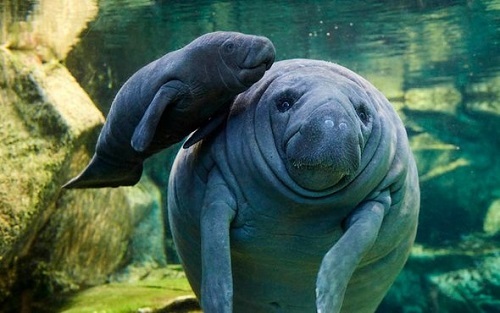 Big manatee and baby manatee. Image source. 2. I've been listening to Pink's "F***ing Perfect" as a spiritual practice. 5. Inclusive language for worship and preaching (posted March 28) "Avoid associating Christianity or discipleship with things such as: Being soldiers / Being in an 'army' / War"
6. Power grab by China's Xi Jinping: President for life? (posted March 5) So Xi Jinping is trying to be president of China forever. I haven't really been following this so I don't know the details, but some of my friends here are very concerned. And they said it's a really sensitive topic, we shouldn't talk about it in public, and it's not safe to post anything about it on Chinese social media- your posts will get *mysteriously* deleted. 7. Shorter John Piper: Women Can Be Possessions, or They Can Be Prey (posted March 27) [content note: sexual assault, domestic violence] "Individuals like Piper have created an imaginary past where men chivalrously “took care of” women, and women in turn smiled sweetly, with nothing more to worry about than caring for their children and decorating their homes. That time did not exist."